This is a very nice project for the 3rd grade that, with a little preparation, can be finished in an hour session. In order to keep this art project from taking too much class time, I prepared the brown grocery sacks before class. 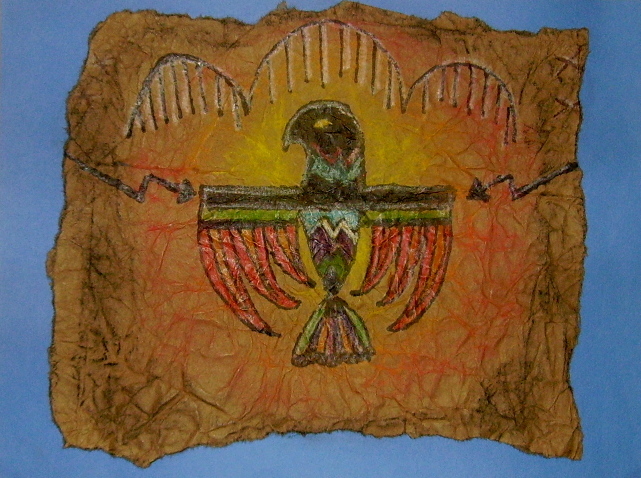 I found examples of American Indian art by searching on Google images. I printed some of the images and we discussed what they represented in respect to Indian culture. For directions on preparing the brown bags, supplies needed and some 3rd grade completed works, look at “American Indian Art” in the 3rd Grade Projects Gallery in the sidebar. This entry was posted in 3rd Grade and tagged 3rd Grade, art project, arts and crafts for kids, brown bag indian art, brown bag leather, classroom decorations, classroom indian art project, faux leather art project, grocery bags, Indian art, indian art for kids. Bookmark the permalink.